As the Tesla Model 3 gains significant production volume, with most of the 2018 deliveries going to US customers, other players in the US small and midsize luxury car segment look set to see their sales halved in Q3 and Q4. Tesla pointed to this emerging trend in its Q1 2018 Update letter, graphing Tesla’s growing sales relative to longtime leaders such as the BMW 3 and 4 series, the Mercedes-Benz C-Class and CLS, and Audi’s A4 & A5 offerings. As the model 3 ramp is now gaining traction, with estimated US sales in May of 9,000 vehicles (despite many units being diverted to Canada), the impact on segment competitors will soon be felt in earnest. Tesla has indicated that it will be almost exclusively selling the Model 3 cars it produces to the US market in Q3 and Q4 of this year, at volumes approaching 21,600 units per month (5,000/week) from late July or August onwards, perhaps pushing even higher in Q4. Zach did a US sales volume comparison a few weeks ago, charting the inexorable rise of the Model 3 relative to its likely competition. Here, I take a look at how the sales of longtime leaders of the segment may be affected by the rise of the Model 3. The piece is also to remind ourselves what the German luxury brands have done, if anything, to prepare for this car. As a side note, vehicle classifications and segments are an imperfect art, and EVs muddy the water further by offering more interior space than combustion vehicles of the same external size (both these metrics often being used for segment classification). Electric cars are also inherently more “luxurious” and “refined” (quieter, smoother power delivery, lower centre of gravity, etc.). Regardless, most observers agree with Tesla about which established vehicles the Model 3 is most keenly going to be competing with in the US market. The German luxury brands achieved a combined 22,911 average monthly sales in 2017, some 61.4% of the total market. Other significant players in the segment include Infiniti, Lexus, and Acura, which together share 10,406 monthly sales (just under 28% of the market), and the remaining 10% is divided between Volvo, Cadillac, Jaguar, and Alfa Romeo. Now consider that the Model 3 will soon deliver into this same segment monthly volumes between 21,600 (at 5,000/week) and 26,000 (at 6,000/week). Let’s call it 24,000 per month — that’s over 62% of the entire segment’s average volume in 2017. It is more than the BMW, Mercedes, and Audi sales combined volume, which have been very happy to have the lion’s share of the segment to themselves up till now. Thus, there can be no question that all the incumbents in this segment are going to be massively disrupted. The only small comfort that the existing players can hope for is that, since some of the Model 3’s buyers will likely be converting from a couple of nearby segments, the overall segment volume may grow somewhat (while those nearby segments correspondingly shrink a little), at least in the short term. But, inevitably, the traditional leaders of the segment will still lose a great deal of their share of the volume. Even if the segment grows from 37,000 to 50,000 per month (a stretch), the Model 3 will still take around half of it and the incumbents will see their combined sales cut from 37,000 to 26,000, losing effectively 30% of their sales. Arguably, the smaller brands tend to have more loyal customers (think Volvo and Jaguar owners), so the larger brands may lose a marginally higher share. I can’t imagine what it will feel like for the German luxury brands to lose 50% of their US sales in their most important segment over a matter of a just a few months. BMW’s total 2017 US sales were 305,685, so this segment’s 117,000 sales are some 38% of their total market. To lose half of this segment therefore means losing 19% of the brand’s total US sales. The segment is similarly important for the other German luxury brands. But our sympathy for their loss of ~20% of US sales due to the arrival of the Tesla Model 3 should only extend so far, since they have had years to plan for this moment, and yet have done little or nothing to counter it. That’s despite the huge financial and engineering talent and resources at their disposal. Tesla announced its plans to eventually produce an affordable family car way back in 2006. It was always going to position itself as a prestige brand, close to the established luxury marques. These exact same German brands have already had first-hand experience (for several years already) of their market share being overtaken by Tesla in the large luxury sedan segment, both in the US and in Europe. The Model S has been competing with them there since 2012. And they have had 26 months of knowledge that the Model 3 is so desirable that it has had hundreds of thousands of folks queuing up for it. In short, they could see this coming from years away. Let’s tell it how it is – the German brands have been sitting on their backsides fumbling around with press releases and half-promises of action on EVs whilst all the time continuing to invest the vast majority of their time and resources into fossil fuel vehicles and trying to wring the maximum revenues out of this century-old technology. They only have themselves to blame. Inexcusably, BMW even had a period of decent EV research and development before its release of the i3 in 2014 (concept shown in 2011), but senior management evidently turned their back on EVs after that (there’s been no new BMW EV since). Many of the engineers who worked on the project eventually left in disappointment with the company. Since they have been in the business of selling cars for decades and more (we all know Benz’s storied history), some may wonder — how can they suddenly lose market position so catastrophically to an EV (an EV?) from a relatively new and small manufacturer? Let’s make no bones about it — EVs are a far superior technology to combustion vehicles. They can run on zero emissions, they are quiet, they are smooth and easy to drive, and they can be charged at home or work. Because of this, they are relaxing and calming relative to combustion cars, exactly the desirable traits of the luxury segments. They offer higher performance in overtaking situations, yet smoother operation in slow traffic. They have lower costs of energy and lower costs of maintenance. Anyone who has driven one is familiar with all these obvious advantages over combustion cars. Until recently, despite the clearly superior technology, it could be argued that EVs were considerably more expensive than their combustion counterparts except at the most expensive end of the market (where the historically high cost of batteries is relatively less of a factor). But the German luxury brands are precisely the ones who were best positioned to exploit this high end of the market, since they sell hundreds of thousands of such vehicles worldwide every year. More than anyone else, they were ideally placed to explore the potential and desirability of EVs in the large premium segments. But they refused to do so, and instead they left that entirely to Tesla to exploit (thanks, guys! ), allowing them to get a solid foothold. So aren’t middle-of-the-market EVs (such as the small luxury segment) still compromised either on price or on practical driving range? That’s long been the argument of the established auto manufacturers as to why they haven’t offered anything other than a few mediocre EVs as compliance cars. But anyone watching the development of EVs knows that the price of batteries itself was not fundamentally destined to remain high. Rather, like most other technologies, the elevated cost was simply an effect of lack of attention and progress on their development and scale of manufacturing. Tesla saw this likely pathway of technological and cost evolution early on and has successfully navigated increasing research, development, and manufacturing scale, whilst others took little or no interest. 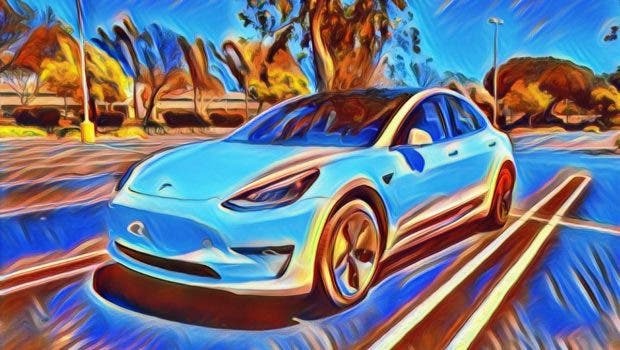 In short, the established brands refused to consider how EVs could, with the right effort and strategy, be developed and marketed at the luxury end and eventually reduce in cost enough to break into higher volume segments. They preferred to rest on their combustion engine laurels. 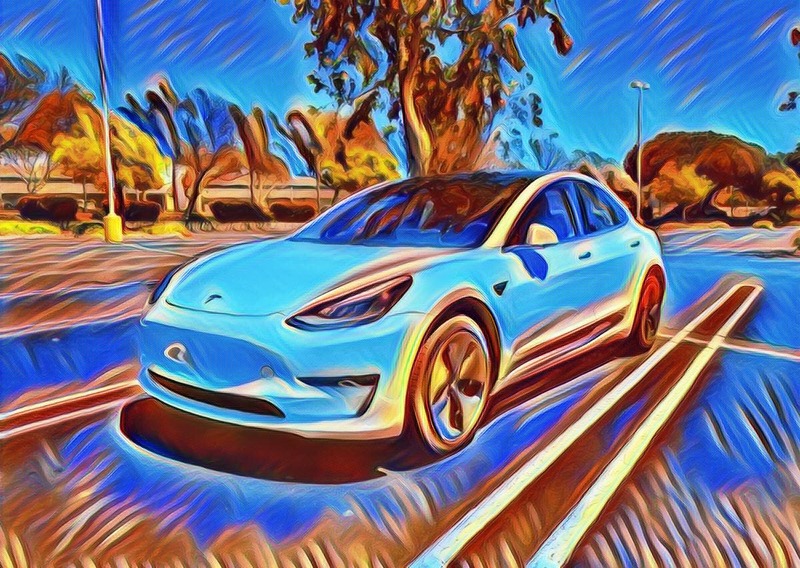 Now we have the Model 3, which, largely thanks to Tesla’s focus on battery costs and powertrain efficiency, does have a very capable range for all practical purposes and is available at a cost (relative to its peers) that is indeed allowing it to break into this higher volume segment — a cost attainable enough for a record number of customers to queue up for one, and a package competitive enough to seriously upset the apfel cart of the German brands in this substantial slice of the market. The price of batteries will continue to reduce rapidly for years to come, with increasing proportions of the combustion automobile market losing out in their inevitable competitions with the superior technology of EVs. The traditional luxury brands should have been the first to turn their hands to EVs, but they missed that boat. Now karma comes their way. Their lunch is about to get eaten by a more visionary manufacturer and — even if they can admit their past mistakes and undertake a sincere change in direction — they will have to work very hard to catch up. If not, they will inevitably go under, because the Tesla tidal wave has arrived. Articles originally published on EV Obsession.